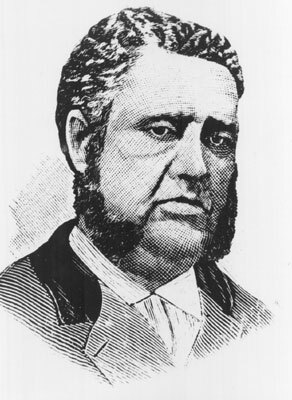 Another leading figure during the era of Radical Reconstruction, Francis L. Cardozo was the scion of a prominent Jewish South Carolina family, though a practicing Christian himself. One of three sons of Lydia Williams, a “free person of color,” and Isaac N. Cardozo, a man of Sephardic descent who worked in the custom house, Francis was educated in the Charleston’s self-supporting schools for free blacks and apprenticed out to learn carpentry. He attended schools in Scotland and England and upon his return to the United States became minister of the Temple Street Congregational church in New Haven, Connecticut. At the end of the Civil War, even before peace was finalized, Francis and his brother Thomas returned to Charleston to lead the American Missionary Association’s efforts to assist the newly freed people. In August 1865, Francis succeeded Thomas as principal of the AMA’s Avery Institute, a position he held for three years. In the next decade he served as president of the South Carolina State Council of Union Leagues, a member of the South Carolina Constitutional Convention (1868), a trustee of the University of South Carolina (1869), secretary of state in the Scott administration (1868–1872), and state treasurer in the Moses and Chamberlain administrations (1872–1876). After the restoration of white rule in 1876, Cardozo was targeted by Democrats in a systematic attempt to destroy the Republican Party and its black leaders. Convicted of corruption in 1877, Cardozo was pardoned two years later, and went on to work for the U.S. Treasury and teach in the Washington D.C. public schools.